How many times did you hear that growing up? Luckily, my mother didn’t cut short my playtime in the rain with that silly sentiment. Playing in the rain or going outside with wet hair does not give you a cold. Contact with several viral bodies of a rhinovirus does. Playing in the rain or going out with wet hair may lower your body’s ability to ward off infection, which would make you more susceptible to the virus, increasing your risk of developing a cold. The actions still didn’t “make” you get a cold any more than eating fast food “makes” you get diabetes. Now, hold on there, sister! Haven’t you been spouting for months and months that the unhealthy American diet causes diabetes and heart disease? Well, without rereading every single post, I can’t say that I didn’t phrase it that way; however, if I did, I misspoke (or miswrote, whatever). I was reminded of that this weekend when a childhood friend shared the meme you see here. There are several different types of diabetes; but there are two main types that we’ll talk about now – Type 1 and Type 2. Type 1 diabetes used to be called juvenile diabetes because its onset normally occurs before age 30. For whatever reason, the pancreas does not produce enough insulin. My great-grandmother had this type of diabetes and my friend’s son has it. They both drew the short straw on this one. They were going to become diabetic regardless of what they ate or did. According to the Mayo Clinic, somewhere between 5 and 10% of diabetics have this type. Type 2 diabetes used to be called adult onset diabetes and I’ll give you one guess to figure out why. This is the kind that I’m normally talking about when I refer to the effects of obesity. 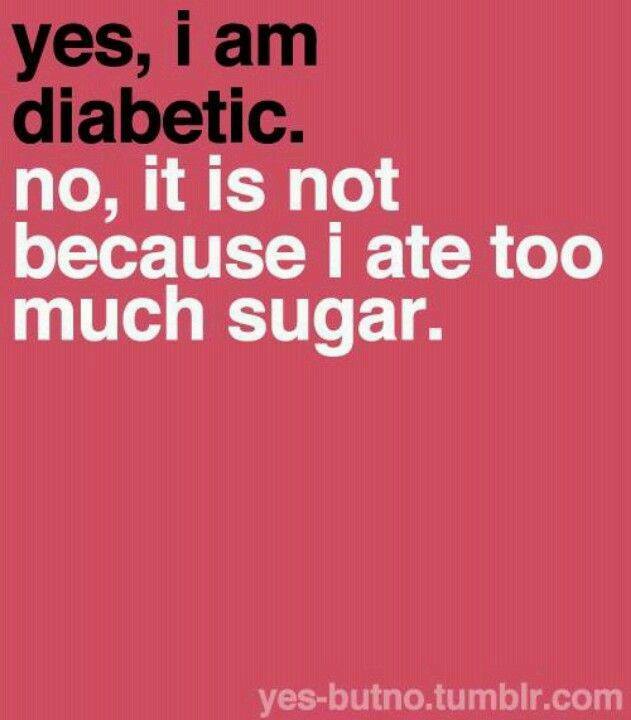 Roughly 90% of diabetics have this type. Of those, about 80% are obese. According to the International Diabetes Foundation, obesity is a factor that increases the risk of diabetes; but, it’s only one of several risk factors. None of them cause diabetes, per se, but they significantly increase the risk a person has of developing the disease. Wait a minute! What about that other 20%? The ones who are not obese? Like my great-grandmother, those diabetics drew the short straw, too. Either they were exposed to some other factor or they were going to become diabetic regardless of what they did. The human body is a ridiculously complex organism and our environments are no less complex. How our environments and behaviors affect our bodies is, well, it’s frankly too much for me to consider this time of day. My mind is boggled at the mere notion. While we like to think that we are smart enough to know all of the answers, the billions of dollars that are spent each year in disease cause and cure research remind us that we’re not as smart as we think we are. We are still figuring the relationships between genes, environment, disease and organism. We don’t know exactly how they all fit together and, it’s my belief, that we never will. Just as non-smokers develop lung cancer and teetotalers develop cirrhosis of the liver, people with healthy lifestyles develop diabetes. It just happens that way sometimes. Those people were either genetically predisposed for it or were affected by some other environmental factor. Have you been affected by a factor like that? Have I? There’s really no way for us to know until we develop the disease or we don’t. That’s out of our control. So, the smart move here is to control those things that we can control, like the risk factors related to lifestyle. Eat more fruits and vegetables. Eat them in a more natural state. Exercise often. And, for goodness sake, before you catch your death of a cold, wash your hands and don’t touch your face. Here’s a tissue. This entry was posted in Exercise, Food, Habits, Social Issues and tagged diabetes. Bookmark the permalink. Look at you schooling me! I always thought the islets of Langerhans were different tissue from the pancreas but NO! Different cells within the pancreas! But that train derailed from your original track of we do need to get back to natural foods to fuel and repair our bodies instead of processed stuff where nutrients have to be ‘enriched’ back into the product to give any semblence of nutrition. Keep preaching , Girl! The choir is getting healthy and trying to spread the word in our little parts of the world. Think about doing a meal planner book with RECIPES for those of us that can’t walk into a kitchen and mix and max and wonderful things appear in pots and pans. It could be an e-book which can be self published and I can help edit and taste test! I’ll settle for the choir getting healthy. We’ve got a nursing home to terrorize sometime in the future!